Dong Ha, the northernmost city of South Vietnam, had once been bustling with military activity. 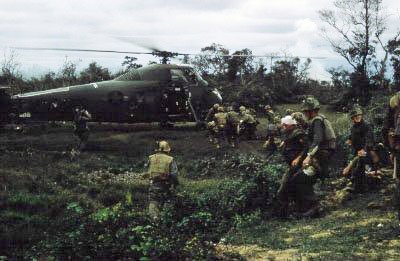 Home of the 4th Marines, a major helicopter base, and surrounded by artillery firebases, it had directly supported the Marines at Con Thien and the eastern demilitarized zone (DMZ). It had provided the starting point for the relief of the besieged Khe Sahn garrison. 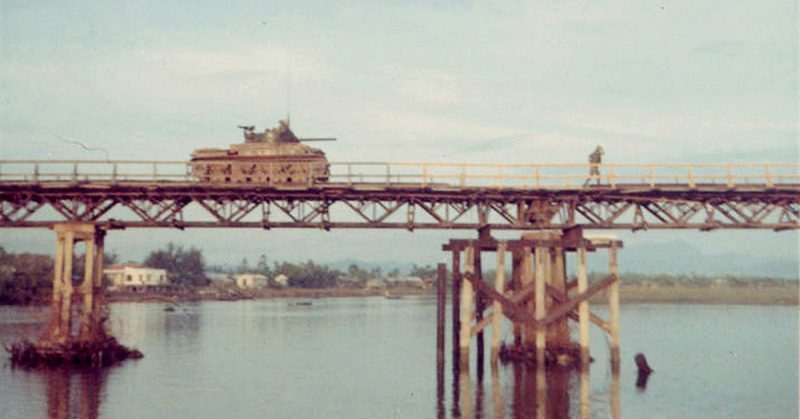 Dong Ha also possessed the best bridge over the Cua Viet River and the direct approach to Hue City, the ancient, ceremonial capital of Vietnam. U.S. Marine Corps technicians examine the Wright R-1820 engine of a disabled Sikorsky UH-34D Seahorse helicopter at the NSAD Cua Viet supply center, near Dong Ha (South Vietnam), 1 October 1966. Five years earlier, there were 50,000 Marines to protect against the North Vietnamese. On March 30, 1972, there was only one battalion of South Vietnamese Marines to stop the vicious onslaught of 30,000 North Vietnamese Regulars in conventional combat units which were reinforced by 200 main battle tanks. 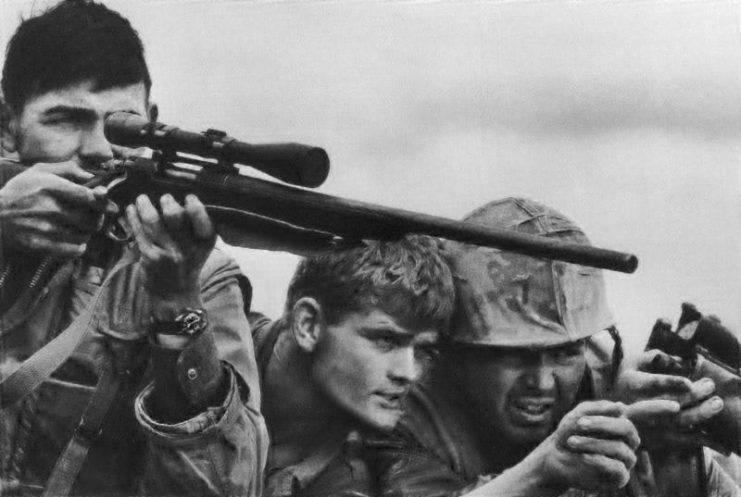 Poised for the headlong assault on Dong Ha and the capture of Hue, the North Vietnamese Army (NVA) did not realize that there was still one U.S. Marine in the city of Dong Ha. That lone U.S. Marine was Captain John Ripley from Radford, Virginia. Ripley had been a daring child with a burning desire to succeed. After he graduated high school in 1957, he followed his two older brothers into the Marines at the age of 17. His desire to succeed was transformed into an indomitable will by the drill instructors at the legendary Marine Recruit Depot of Parris Island. The young Marine’s talent and drive were recognized, and he quickly earned an appointment to the Naval Academy. Despite being unprepared for the academic rigor at the Academy, his sheer effort and determination earned him a degree in electrical engineering and commission as a 2nd Lieutenant of Marines in 1962. At the Basic School at Quantico, Virginia he learned to lead an infantry platoon. On graduation from Quantico, he served a Sea Duty billet, as a rifle and weapons platoon commander, and also as a Force Reconnaissance platoon commander. Ripley attended the U.S. Army Parachute, Jump Master, and Ranger Courses, and the Navy Underwater Demolitions and Scuba courses. In Marine circles he was “dual cool” with a Scuba Badge and Jump Wings. In October 1966, Ripley became the fearless commander of “Ripley’s Raiders,” fighting in places such as Con Thien and Khe Sahn. Remarkably, he was wounded four times but refused more than one Purple Heart as policy at the time meant immediate evacuation. After Vietnam, he was assigned a desk job until he found an unusual method of escaping: by becoming an exchange officer to the British Royal Marines. Having completed the demanding Commando Course, he now became the third human being to have a “quad bod” (completion of Jump, Ranger, SEAL and Commando Training) and earned the Green Beret of the Royal Marines. In command of troops in both the Royal Marines and the Special Boat Service, he served in Malaya and Norway. When he was again designated a desk job at Headquarters Marine Corps in late 1971, he volunteered to return to Vietnam. He was one of only a few hundred U.S. Marines remaining in the country. A lifetime of preparation was soon to be put to the test. Members of 40 Commando Royal Marines, conduct a patrol exercise. 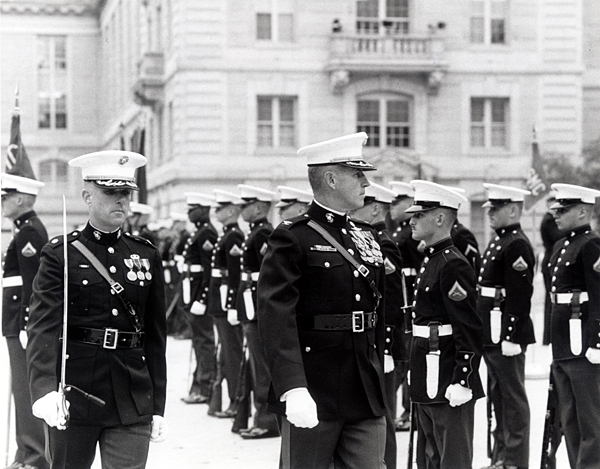 Assigned to the 3rd Battalion of the Vietnamese Marine Corps as Senior Advisor, Capt. Ripley was combat experienced and ready when the Vietnamese Army was not. From over 500,000 troops in 1968, there were now only 27,000 U.S. troops in all Vietnam. The South Vietnamese relied on undisciplined, poorly led conscripts and they fared badly in battle against soldiers from North Vietnam who were their opposites in almost every respect. The Vietnamese Marine Corps was the exception. These battle-hardened troops were disciplined by Vietnamese who had attended the Drill Instructor School at Parris Island. They were led by officers who had attended the Basic School at Quantico. 3rd Battalion 3rd Marines’s command group at Vandegrift Combat Base. As a fire brigade, they faced combat for up to six months, and then returned to their home base for a month to rest before returning to action. 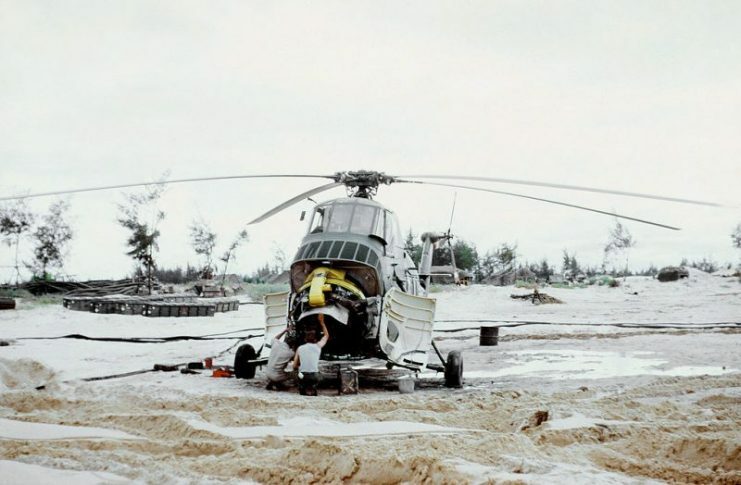 The 3rd Battalion had recently returned from refitting near Saigon and was at full strength. On March 30, 1972, the North Vietnamese Army (NVA) attacked. Intense artillery from the north of the DMZ was followed by assaults that quickly erased the forces guarding the northern approaches. Those not overrun and wiped out were sent fleeing down Highway 1. 3rd Battalion conducts a Medevac while operating along the DMZ. 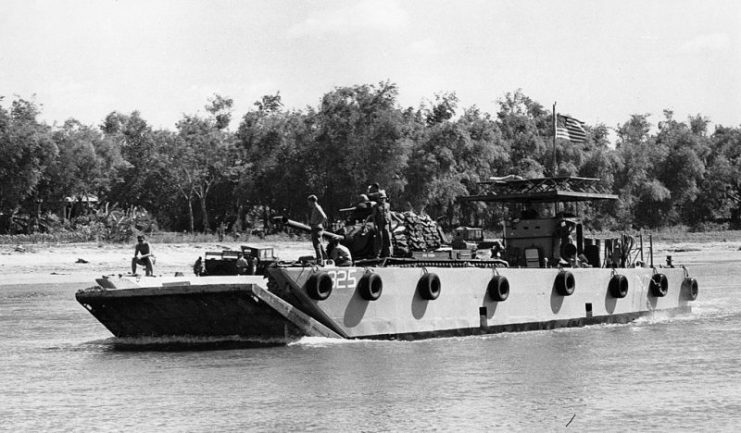 The 3rd Battalion was shifted to protect the vital bridge that provided passage over the Cua Viet River at Dong Ha. The 304th and 308th NVA Infantry Divisions were rolling south with 200 main battle tanks. On April 1, the entire 3rd ARVN Division, the major force remaining in I Corps, was ordered to retreat. The North Vietnamese bore down on Dong Ha. As army troops streamed south, the Marines were facing an impossible task: 30,000 enemy troops. Passing hordes of refugees, the Marines moved into final positions and heard “Expect lots of tanks” over the radio. The 3rd Battalion carried ten light anti-tank rockets, making them almost defenseless. 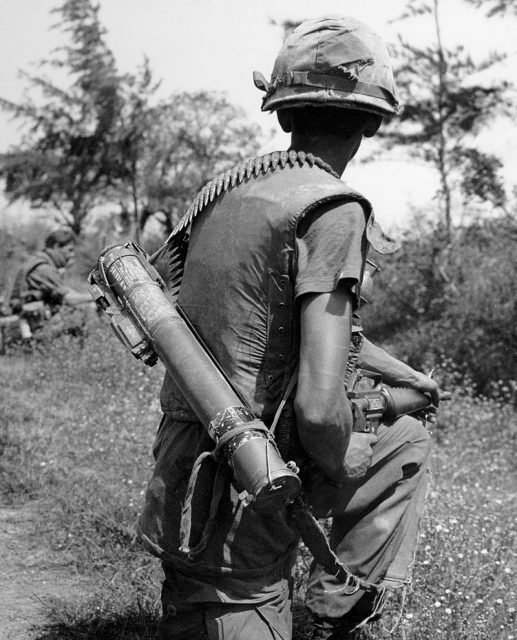 M72 Light assault weapon used in Vietnam, 1968. 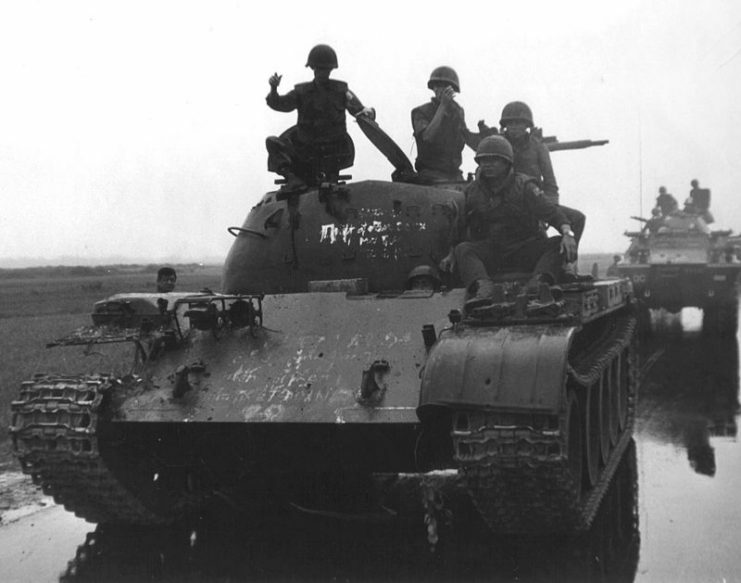 The 20th Tank Battalion of the South Vietnamese army arrived, and the Marines clambered aboard for the final movement to the bridge. Skirmishers were already crossing upstream, over a dilapidated, railroad bridge designed for foot-traffic. Ripley immediately directed the tank he was in to fire, knocking back the enemy. Machine guns and mortars on the opposite bank began a furious fusillade of fire against the tanks and Marines. The North Vietnamese infantry regrouped and reorganized behind a small rise that protected them from the tanks. 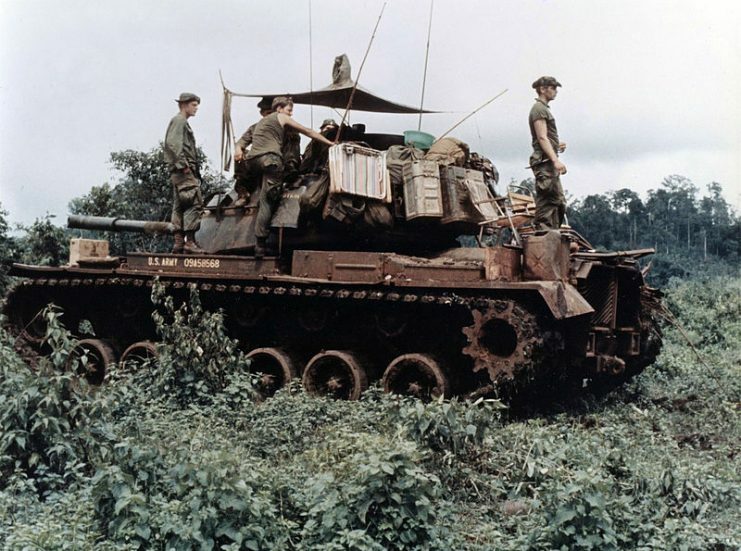 North Vietnamese T59 TANK captured by South Vietnamese 20th Tank Regiment south of Dong Ha. The small column of Marines riding M-48 tanks continued slowly, surrounded by civilian refugees fleeing the approaching forces. 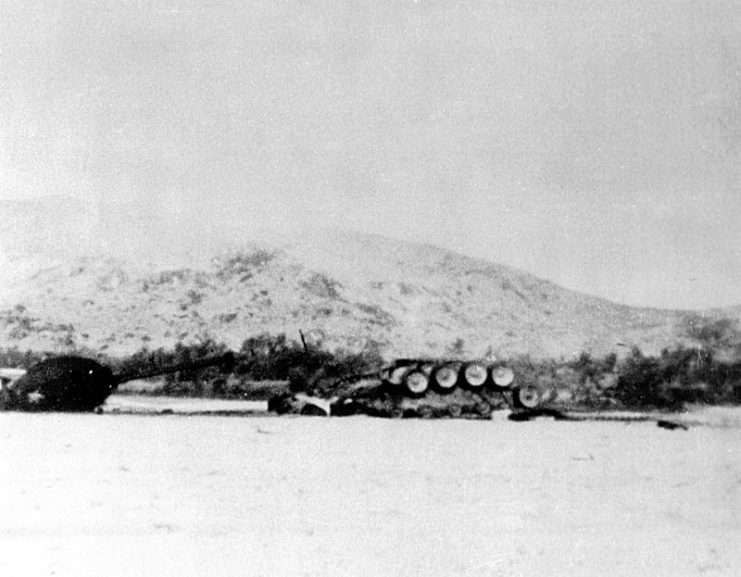 A column of Soviet-supplied T-54 tanks was spotted across the river and was taken under fire by the 20th Tank Battalion. The T-54 outgunned the M-48s. Head on, the remaining T-54s would slaughter their smaller opponents. The Marines knew they had to get to the bridge ahead of the enemy. If their opponents got across, the battle, and maybe the war, would be lost. The M-48s stopped well away from the bridge. The Marines climbed down and continued on foot. Ripley watched the lead T-54 reach the bridge and begin to cross. A Marine with a light anti-tank rocket hit the tank. The stricken vehicle pulled back to a covered position. Under enemy fire, Ripley made a mad dash to an old bunker 100 meters from his position and 100 meters from the bridge. Accompanying him was his Vietnamese radioman, Maj. Jim Smock, advisor of the 20th Tank Battalion. A vicious cross-river firefight began as Ripley and Smock made the last dash to the bridge, praying there would be a way to bring it down when they arrived. A bundle of explosives had been delivered but had not been prepped for use. The bridge was constructed of steel I-Beams, overlaid with steel decking and two feet of timber sitting atop six-feet-thick concrete supports. The bridge could only be brought down by demolition. Since the deck of the bridge was fully exposed to enemy fire, the only way to set the explosives was by hand and from underneath. Captain John Ripley ( left ) Advisor to the 3th Vietnamese Marine Battalion and Major Le Ba Binh next right-battalion commander. From underneath the bridge, Ripley would be able to slide the cases of TNT between the edges of the I-Beams to a point in the middle of the river and set satchel charges to cut the I-Beams. There were six I-Beams in total, creating five “channels” through which he would have to drag explosives. Once he’d climbed over the fence, Ripley’s legs were shredded by the razor-sharp concertina wire protecting the south end of the bridge. Ripley went hand-over-hand under the bridge amidst enemy fire. He finally reached the concrete support 90 meters away, and swung himself up and into the channel created by the I-Beams. Setting charges to cut the beam, Ripley traveled back down the channel. Smock passed him the two 75 lb. TNT cases and satchel charges which Ripley dragged back again. He set the charges to cut the other beam. One channel was rigged, but there were still four more to go. Two hours later, completely spent, all the channels were finally set for the explosion. Dropping to the ground and curling into a ball, Ripley rested for only a moment. Retrieving primer cord and crimping the blasting caps, he looped the coils over his shoulders and crawled back out, legs dangling and drawing fire. Having set the primer cord alight with matches, Ripley crawled out once more to set a backup detonator with electrical caps. Returning to the bunker seemed to take an eternity as Ripley’s legs woodenly refused to move quickly. He ran under fire from the other side of the river. With a gut-wrenching, earthshaking explosion, the bridge was finally destroyed. 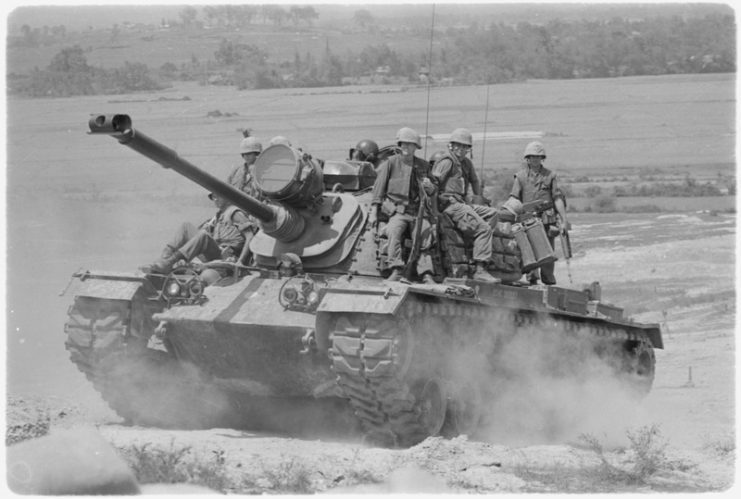 The Marines and South Vietnamese tankers continued to hold Dong Ha. 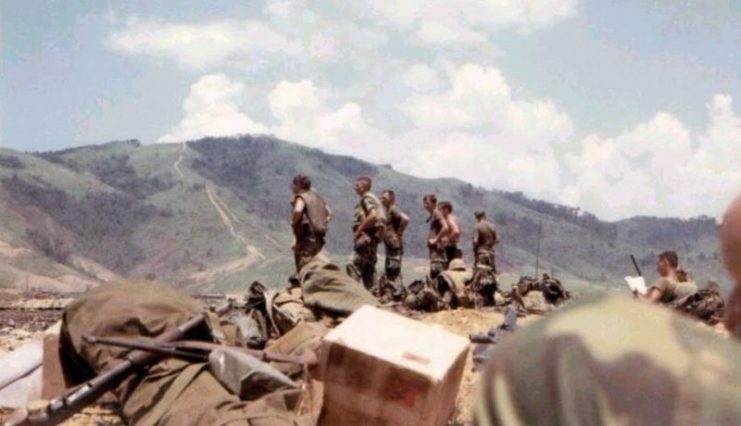 An attack from the west cut through to Highway 1 south of the city, but the Marines continued to fight, surrounded. One by one, the M-48s were destroyed or ran out of gas. Ordered to breakout, the surviving tankers shouldered rifles and joined the Marines. 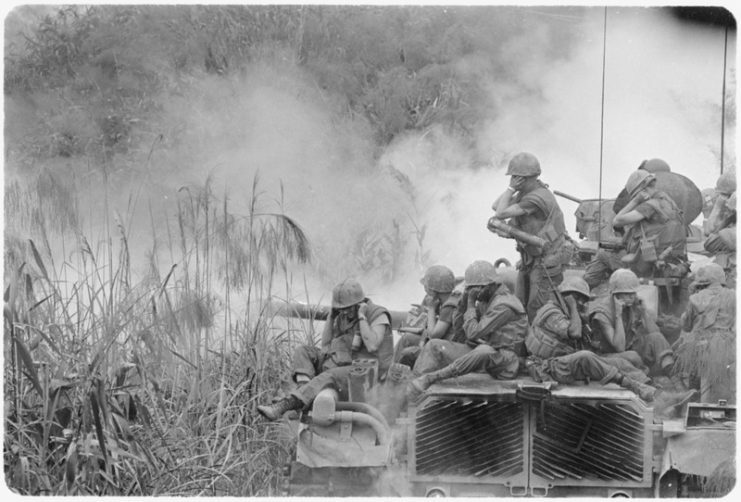 Continuing the fight at Quang Tri City, the 3rd Battalion was finally pulled out of the line. Of the 700 men who had begun the fight, only 52 remained. The Easter Offensive was beaten by the North’s inability to capture Dong Ha quickly. Eventually, the Northern Troops withdrew. Three years later they would return, this time, for good. 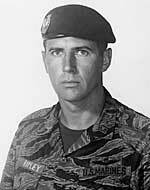 Ripley remained in the Marine Corps, eventually commanding an infantry battalion then an infantry regiment. Always attempting to evade a desk job, he finally found one he enjoyed at the U.S. Naval Academy as an English and History instructor. Later on, he was the commander of the Naval ROTC unit at the Virginia Military Institute (VMI) in his native Virginia. Retiring as a Colonel in 1992, Ripley accepted a position first as the Dean then later as Chancellor of Southwestern Virginia College, and later on still at the Hargrave Military Academy. Ripley returned to duty in July 1999 to lead the Marine Corps History and Museums and Historical Center. He passed away on October 28, 2008. John Ripley earned the Navy Cross for his heroic actions on the bridge at Dong Ha. But the legacy he was most proud of was having commissioned over 500 young Marine officers between his time at the Naval Academy and VMI, a record held to this day.